Item number Na832 from the MOA: University of British Columbia. Print depicting a young woman in profile with her head facing to her right. She is wearing traditional clothing and has waist-length braids. The names of the artist and printmaker in Inuit syllabics with a Cape Dorset stylized red igloo seal are near the bottom right-hand corner. 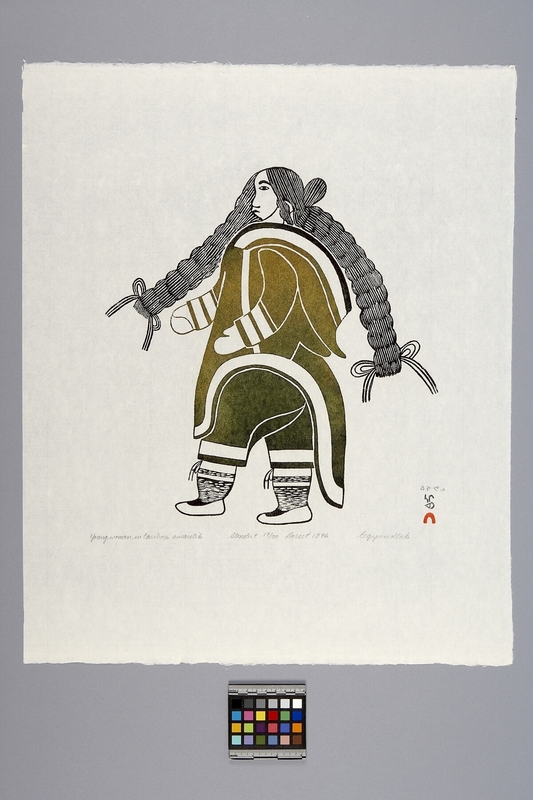 Below the image is written, "Young woman in Caribou amautik stonecut 17/50 Dorset 1976 Eegyvudluk." The Canadian Eskimo Arts Council's blind embossed stamp is in the lower right-hand corner.